Penguin Pools of Milwaukee, WI is now pleased to announce that we are offering and installing the full line of Harmony Outdoor Living Products. Harmony Outdoor offers modulated outdoor living spaces made from Unilock Pavers. By having your designs pre-built, we can install them quicker and for less money than if we built the whole thing from scratch. 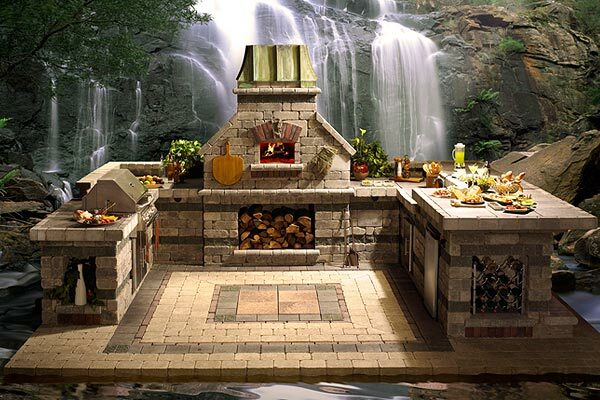 You can combine fireplaces, wet bars, grills, benches, tables, firepits ... the options are endless. These units really transform and inground vinyl liner pool into something great. The great thing is that Harmony is located in WI so it has distributors like us (Penguin Pools) in Waukesha, New Berlin, Merton, Waterford, Brookfield, & Sussex. If you have any questions or would like Penguin Pools to give you a free estimate, don't hesitate to contact us directly.